E-commerce technology is more advanced than ever. Fine jewelry is a hot commodity all over the world. We left no stone unturned in our quest to find the quintessential elements of a jewelry e-commerce site. Simplicity Simplicity is the secret to designing an e-commerce jewelry website. The focus is supposed to be on the aesthetic beauty and monetary value of the product. The web design, in this case, must not overpower the stock. Data Collation Before going into jewelry website development, make sure all your inventory is systematically organized in spreadsheet format like Excel or Google Docs. It may include jewelry stock number, design number, metal, size, stone details, stone origin, cut, size, price etc. Photography Photographs are one of the most essential components of a jewelry website. Photographs of inventory taken in different angles and good lighting conditions add major value to a jewelry website. Clean design aesthetics, beautiful photographs and wonderful typography are the key niceties a gorgeous e-commerce jewelry website has to offer. Payment gateway integration To include e-commerce to your jewelry website, include plenty of payment options for your jewelry purchase. To make big purchases offer trust and protection to the shoppers by including multiple payment options. Shopping cart processing Configure your shopping cart and process the order. Partner with a trusted shipping provider to deliver your invaluable pieces of jewelry. Build your own jewelry We specialize in integrating diamond database through RapNet API and IDEX and deliver a Ring Builder and Build your own Jewelry tool. Virtual jewelry try-on Virtual jewelry try-on feature is based on the concepts of Augmented Reality. It enables shoppers to try and compare unlimited inventory of necklaces, earrings and bracelets on their own photo and share their images on various social media platforms like Facebook, Twitter and Instagram. 3D jewelry viewer 3D jewelry viewer provides stunning 360 degree rotating views of jewelry. When customers cannot visit the brick and mortar store, we believe in providing an online shopping experience that is vivid and life-like. WordPress is an open source content management system. It comes with a great level of flexibility and user-friendly features and functionalities for your jewelry website development. WordPress website development services let you develop, customize, and manage your jewelry site the way you like. Also, WordPress is a model platform since it is enhanced with various SEO features. 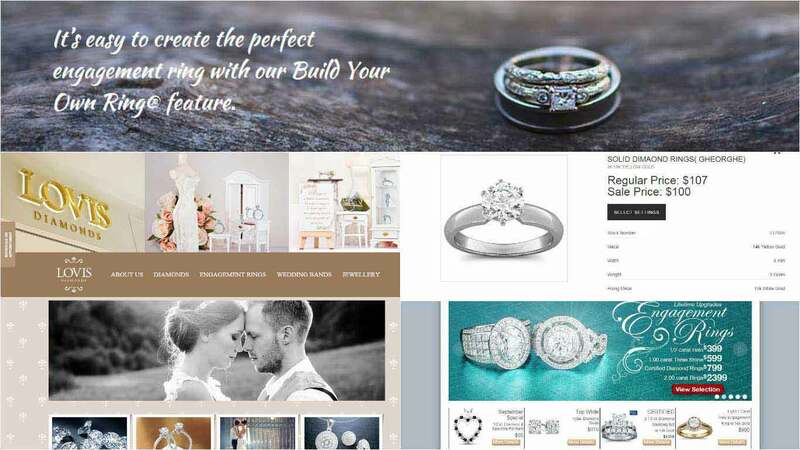 NetFillip, a leading company in jewelry website development, offers a comprehensive range of WordPress development services including WordPress template design and custom WordPress design services. NetFillipians can equip your jewelry website with a large number of widgets or plug-ins to add more functionality. Easy inventory management will enable you to have utmost control over the products and content of your site without even touching the code. To make your site stand out of the crowd, taking the help of our jewelry website development services is an ideal option.